One of the most used common rooms in many households is the bathroom. Because of this, sometimes it’s easy for a bathroom to get cluttered and messy with every day use. One way to help combat this is by having a more organized bathroom with these easy bathroom organization tips. And for an uninspired homemaker like me, easy tips are always some of my favorite tips. One area to start with is the counter top if you have one. Bins can be used to hold personal items like toothpaste, hairbrushes, combs, etc. And you can easily have one bin per family member for storage purposes. By storing these items underneath the counter in cabinets, you can also keep them out of sight when they aren’t in use. Other items for counter top storage include toothbrush holders and soap dispensers. Another area that you can use for bathroom organization is above the toilet. Either by installing cabinets or by using a shelving system, you can make use of the existing space in your bathroom without having to spend a lot of money for extra renovations. These can easily become simple DIY weekend projects and in no time at all, you’ll have more space to store stuff. Items that could go in this area are extra bars of soap, folded towels, and toilet paper. 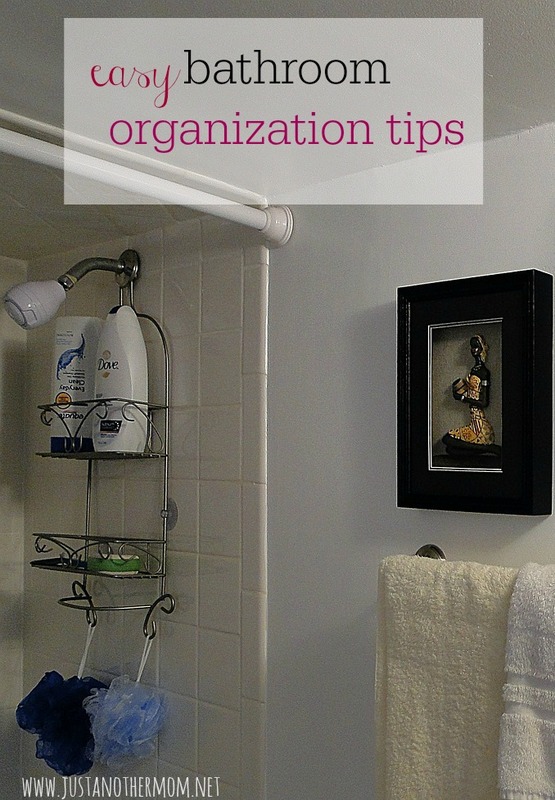 Another area to consider organizing is inside of your shower. Depending on how much space you have, you can use a hanging caddy on your shower or waterproof shelves on the walls. Another option would be baskets to hang along the wall. Hang hooks on the wall or install bars to hold towels. Organizing the bathroom doesn’t have to be difficult, and it doesn’t have to be expensive either. Make use of the existing space that you have and maximize the potential for storage by using multiple storage units and options. How do you make the most of organizing your bathroom? 100+ Easy Organization Tips Here!